Even less fortunate are the tasmanian devils who have so little genetic diversity that they are being decimated by a transmissible cancer. After fighting with an infected devil, which has tumors on its face and neck, tiny bits of the cancer will get into an uninfected devil’s wounds, and since the immune system can’t distinguish the foreign cancer cells from the devil’s own cells, the cancer cells reproduce unchecked, the trait that makes normal cancers, produced by mutated versions of our own cells, so deadly. And the solution mentioned in the article, to save the species by protecting 200 individuals, while better than letting them all die, will sacrifice even more genetic variability by subjecting the already inbred devils to a new population (and genetic) bottleneck. Well now we know even more about the original of the cancer cells responsible for “Devil Facial Tumor Disease” (A truly frightening name). By studying the expression patterns of normal genes and microRNAs, a group of researchers have confirmed once and for all that the cancer cells really are being transmitted from one devil to another because the genes they looked at were identical in sequence in cancer cells taken from 25 different devils. 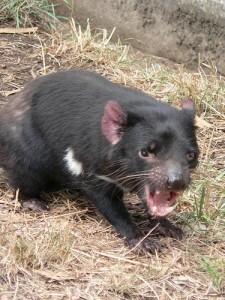 The researchers place the original of the cancer as a more regular (mutation induced) cancer that arose in Tasmanian Devil living approximately two decades ago and even believe that they can identify that first mutated cell as a Schwann cell*. Clearly there’s been evolutionary pressure among the cancerous cells to select for further mutations that better adapt cancer cells to transmission and reproduction from one devil to the next. The person who pointed me at this story suggested the transmissible cancer could actually be considered a new (pathogenic) species. After all, it reproduces (too successfully for comfort in fact) and evolves independently, and clearly it is permanently reproductively isolated from the normal cells of Tasmanian Devils. It no longer reproduces sexually, but that hasn’t stopped various species of reptiles that have decided to do without the male gender (for example, various species of New Mexican whiptail lizards) from being considered true species. What do you think, should Devil Facial Tumor Disease be considered a new species? *A type of cell that produces the myelin sheath around nerve fibers (which speeds up and insulates the electrical impulses conducted through the nerve cells and somehow are also involved in keeping nerve cells alive. Here’s the wikipedia article, the last time I remember hear about Schwann cells was high school biology, I’m really more of a plant man. Ha! a very cool question. i guess you could make the argument that the cancer is a separate species! there’s certainly no shortage of asexual microbial “species,” of course that term gets pretty arbitrary outside of green plants and animals.